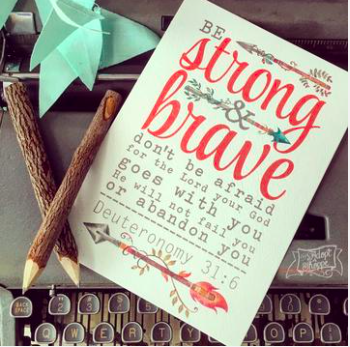 “Be Strong and Brave…” it says on a card above my desk. I bought it for my boys’ room, but haven’t found a frame for it. So it stands up on the window above my desk. Strong and brave is something I’m not very good at. In fact, I’ve had a lot of moments when I’ve wanted to give up because I was too afraid. (Or too depressed; or the anxiety was too great; or the future was too foggy). 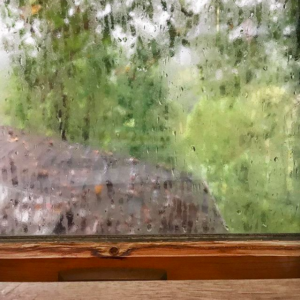 It was rainy, and the weather had turned so there was condensation on my window pane. And if I had opened the window, it still would have been foggy. 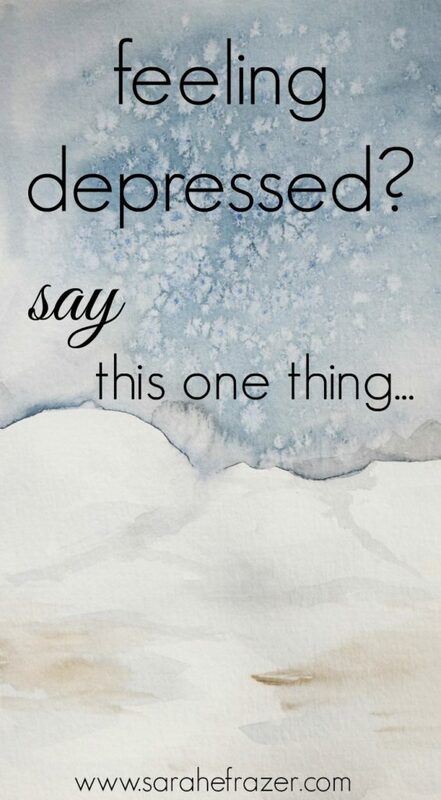 Depression is like that, isn’t it? We look out at the world and see only the a blurry mess. There are lots of ways to describe depression. And you can look definitions in a dictionary. But the best picture I’ve found is the one above. Depression takes a familiar view and distorts it. It gives us a “misty view” of our life. The beautiful thing is the Lord spoke to me when I noticed my window matched my mood. I heard a little whisper: but you know what the view is, so don’t let the mist throw you. You know what beauty lies behind that fog and rain and dreariness. And He was right (of course). I knew the mountains and the trees and the colors of the leaves because I remembered them. It has not be a coincidence that I’ve been listening to Annie Down’s book Remember God book. I’ll give you my full reflection on that book soon….but God was telling me something with the window and Annie’s book: remember. My word for 2018 was “restore” and I’m not sure if I just picked that word because I was super hopeful, or what. But I’ve come to see God restoring places in my heart this year that have been hurt, broken, and scarred. We all have hidden hurts, don’t we? And depression has been one of mine and in 2018 I was ready for God to “restore” the depression. Only my idea of “restoration” and His has been totally different. Once again, that is a longer story for another time. Even though I’ve seen God restore my depression, it doesn’t mean it has gone away. In fact, I struggle still to this day with this terrible beast. I know what it feels like to have the emptiness unfilled. The peace doesn’t come right away. And we can read our Bibles, pray, go to church, and do all of the “right” things – and God will still remain silent. God will sometimes call us into a season of wilderness living – and instead of providing the courage, bravery, or the peace: He simply says: I’m with you. Instead of providing the courage, bravery, or the peace: God simply says: I’m with you. I will believe with my head what my heart has forgotten. I will choose to claim His promises of new mercies and lovingkindness and true faithfulness will come in the morning – with the sun. Like the sun. Better than the sun. I will believe with my head what my heart has forgotten. As the winter season and Christmas comes around just a few weeks away, I needed to remind myself of TRUTH and the best way is to have it hanging literally everywhere! 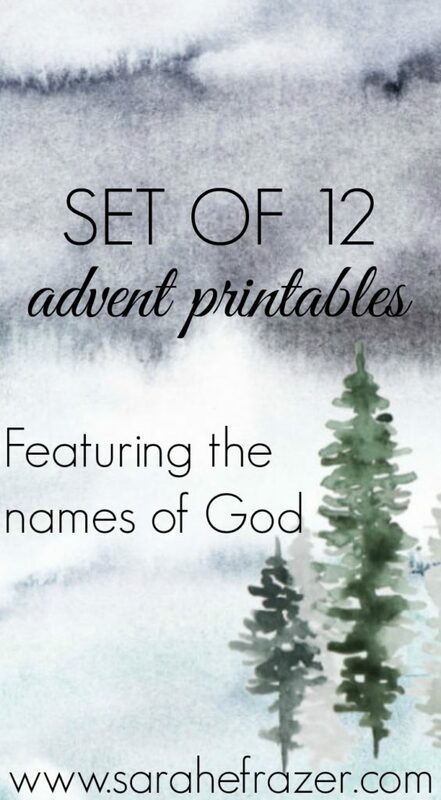 I’ve created this package of 12 prints great for the advent season, but even after Christmas and into the new year. I hope you get them before the sale ends. Regular $10 and now only $5 (for a limited time).